President Jolecia Glynn was quick to point out that the theme goes beyond drinking eight glasses of water literally. She stated that it also refers to these eight things relating to the impact of water in our daily lives: conservation, sustenance, security, sustainability, reusing, recycling, habitats, and recreation and religious beliefs. 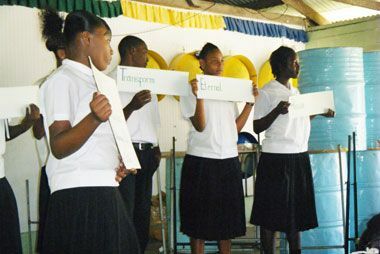 Public Relations Officer Dawnlyn Bynoe announced that the group will be focused on testing residentsâ water supply and offering suggestions to improve and protect it (verified by the CWSA); the distribution of pamphlets; visits to schools; and cleaning of the two major reservoirs on the island. According to the Treasurer Amanda Miller, the group is also hoping to access funds from the RBC Blue Water Project, by way of the Internet, based on information from the RBTT 2011 calendar, which is centered on water. They have already begun their fund-raising by way of a Valentineâs Day cake sale. World Water Day is being celebrated on March 22 this year and the group hopes to have a white/blue T-shirt campaign around that time. Secretary Jenique Edwards is encouraging people to participate in the discussion on their Facebook page, which is already launched. The goal is to reach as many persons as possible. Frequent contributions to the weekly newspapers on water are also on the agenda. The theme for this yearâs RBTT Young Leaders is :Water: Beyond the surface, sustaining life, securing our future.